West County CERT is holding a basic training course in April at the Joint Forces Training Base. This is a golden opportunity to find out more about CERT and prepare yourself and family for an emergency event. 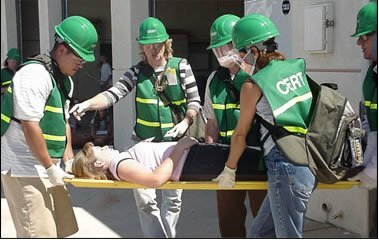 The CERT basic training course covers basic disaster response skills, such as fire safety, light search and rescue, team organization, and disaster medical operations. Using the training learned in the classroom and during exercises, CERT members are better able to assist their family, neighborhood or workplace following an event when first responders (paramedics, fire, police) are not immediately available to help. This is why attending the CERT basic training is so important for you – for the safety/survival of your family, if no other reason. Please make the time and take this course. Plus, you may even have some fun while you learn. Friday, April 7 6:00 p.m to 9:00 p.m.
Saturday, April 8 8:00 a.m to 5:00 p.m.
Friday, April 14 6:00 p.m. to 9:00 p.m.
Saturday, April 15 8:00 a.m. to 5:00 p.m. There is no charge for the course and is open to anyone 18 years or older; 16+ with parent or guardian permission; 14+ with parent or guardian participation. Get your application here and follow the directions to register. Your CERT training may be used just for your family, or in neighborhoods, businesses, and schools. Trained CERT members realize that in the event of a major disaster they may be required to rely on themselves and their neighbors to handle emergencies until first responders arrive. And you just may have some fun while you learn how to survive the next disaster. People who go through CERT training have a better understanding of the potential threats to their home, workplace and community, and can take the right steps to lessen the effects of these hazards on themselves, their homes or workplace. When a disaster happens that overwhelms local response capability, CERT members can apply the training learned in the classroom, and during exercises, to give critical support to their family, loved ones, neighbors or associates in their immediate area until help arrives. CERT members can also assist with non-emergency projects that improve the safety of the community. CERT members can increase their knowledge and capability by attending classes on animal care, special needs concerns, donation management, community relations, shelter management, debris removal, utilities control, advanced first aid, Automatic External Defibrillator use, CPR skills, and others. CERT member also can use their skills to help the program flourish by volunteering for scheduled events. There are many jobs within a CERT for someone who wants to be involved and help, such as documentation, comforting others, logistics, etc. Non-disaster related team activities may include keeping databases, developing a website, writing a newsletter, planning activities, helping with special events and organizing exercises and activities. During CERT classroom training, if one has a concern about doing a skill like lifting, just let the instructor know. You can learn from watching. We would like everyone who wants to go through the training to have an opportunity to participate and learn the skills. CERT educates participants about local hazards and trains them in skills that are useful during disaster and life’s everyday emergencies. The text of the Volunteer Protection Act of 1997 is available to view here. Also there is information about State Liability Laws from FEMA and the Citizen Corps. During training, each sponsoring agency should brief its CERT members about their responsibilities as a CERT member and volunteer.